I don't envy any MP having to make the call whether to support the deal said to be on the table. Not least least since nobody has actually seen it. Never in the field of British politics has so much been written by so many about so little. If it does exist, though, it is likely to sub-optimal - but it was never really going to be any other way. This question is fundamentally is a balance between principle and harm reduction. I start from the basis that no deal is a very bad thing. Repairing the damage could result in a web of asymmetric agreements in the EU's favour and any future administration, probably even weaker than this one, would feel there was no choice but to accede to EU demands. There question, therefore, is whether it would be worse than the withdrawal agreement on offer. And the answer is probably yes. Here you have to look at what we'd be signing up to. I don't imagine the rumoured deal is much different in substance to the draft we saw in March. The technicalities may differ but in essence it is the same beast. So what is it? Put simply it is the bare bones of trade governance, enough for the EU to relax its third country controls along its frontier in Ireland. Here we have MP and professional moron, Steve Baker, remarking "Quite how the Withdrawal Agreement has gone from 130 pages in March to over 500 now, I don’t know". Well I do. Trade governance by its very nature is complicated and wide ranging and there are a number of legacy issues that cannot be left unaddressed. Trade cannot operate in a legal limbo and we have political and moral obligations as a departing member. In respect of that, there are a number of areas where the EU retains the right to interpret its own rules and retains exclusivity over decision making - particularly in respect of controls on goods in Northern Ireland. This is a dilution of UK sovereignty. The question for me is to what extent does it particularly matter? Sub-optimal yes, but tolerable. As to the rumoured UK wide customs union, more than likely ti will come with aspects of the Union Customs Code and a myriad of other customs stipulations. It will have an impact on the scope of future trade policy but by no means prevent us from having an independent trade policy. The trade debate is far too hung up on tariffs when the real cost of doing business is non tariff barriers. We already enjoy minimal tariffs with much of the world. The difference is likely to be marginal. Turkey still does FTAs and even with zero tariffs so does Singapore. Essentially the agreement is a piece of legal technology to achieve a number of mutually agreed ends. You don't have to like it (I certainly don't) but within the confines of reality this is how these things are done. EEA Efta was a better approach being that it is a whole UK solution that does not require a customs union, but Brexiters wailed about that and they will wail about this even more. A typical example is Chloe Fuckwit from the Taxpayer's Alliance. She grunts "I really don't think politicians understand the scale of anger there will be in the country if they try to keep Britain in the EU by the back door. People aren't stupid. You can call it Brexit, but if we've signed up to be a rule taker from Brussels, we're chained to the EU". This is where I think Brexiters are unfair to Theresa May. In her own flailing and inept way she has tried to honour the spirit of the referendum. She ruled out the EEA because she bought into the mythology surrounding it, largely thanks to her advisers. Having done so she was left to reconcile the technical issues with the available remaining options. The deal as we now understand it is really the only way to crack the nut. The fact is that the EU is our single largest trade partner, the gravity model in goods applies, and regulatory harmonisation is the bedrock of frictionless trade. Boris Johnson et al routinely gloss over these facts of life to tell us that a simple FTA is sufficient in nature for the whole relationship with the EU. This is the persistent Brexiter lie. What we have not seen in discussion since Barnier rejected Chequers is what the core trade relationship will look like. We have to assume that the baseline is a standard comprehensive FTA along the lines of Canada or Japan, government by the same strata of WTO rules. Clearly this is insufficient if we are to avoid customs problems at Calais and elsewhere. May will need to commit to rudimentary regulatory harmonisation at the very least - as can be found in EU FTAs. Japan, for instance, has now adopted UNECE automotive regulations in full. Once we have secured a withdrawal agreement, it is likely that in transition the EU will be able to go further than previously stated for maximum facilitation of trade in Calais. We probably cannot say the same for services. It will, though, result in a degree of "rule taking" and the main topic of discussion will be the extent of ECJ influence and the kind of arbitration systems therein. It won't be Chequers, but when added to the Northern Ireland backstop (assuming it is activated) it will be a Frankenstein variant which Brexiters will say amounts to the same thing. Following on from that we will see the relationship evolve with further rule taking to restore a degree of market participation along with a string of supplementary bilateral agreements so that what we end up with is not entirely dissimilar to Switzerland but without the Efta advantages. One way or another the UK will still be caught in a tangled web of complex EU red tape because that is the nature of the beast and that is how it goes when you are the junior partner in an agreement with the EU. There is only really one window left to avoid this and that is to agree to the backstop as is but make damn sure it never gets activated and then join Efta and adapt the EEA agreement. Brexiters will likely see this as an attempt to rejoin the EU and that is what their propaganda will say. They will still have some traction in that the worst effects of Brexit will be held off by the "vassal state" transition. They will probably succeed in once again defeating the option. But is this "BRINO"? No. Even with a labyrinthine array of binding agreements, out of the EU is out of the EU. Even with extensive adoption of EU rules on goods and trade, it is still only a fraction of the EU acquis and still based on global standards, Codex, UNECE, ISO etc. It's going to be messier, it won't be "full sovereignty" (insofar as such a thing exists) and it will mean massive job killing red tape for business. It's either that or no deal at all and lose the vast majority of our trade with the EU. 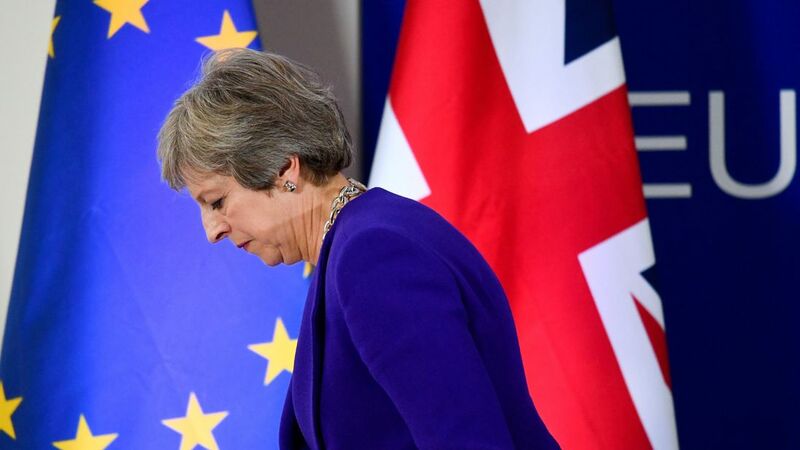 What we are left with is really the consequence of Brexiters failing to produce a plan and ruling out all of the viable alternatives and ducking the difficult questions leaving poor old Theresa May to reconcile the irreconcilable while taking abuse from both sides. The Brexiters opted out of the adult discussion and they even resigned their cabinet posts. They opted out so in my view they don't get to wail about the outcome if they don't like it. Brexit was always a matter of choosing from a limited array of modes for the new relationship. By ruling out the Efta EEA option we have chosen vassalage over partnership. The only alternative is isolation under WTO rules and a collapse of UK exports. Every option has its trade offs but the Brexiters refused to engage thus it was decided for them. This is exactly why The Leave Alliance said we needed a plan from the outset. The idealist in me wishes things were different. But they aren't. There are bitter pills to swallow. The nihilist in me is hoping for a no deal precisely because it will humiliate the Tory right and the Brexiters while also bringing misery to the remainers. A political version of a high school gun massacre. But the adult in me says that this deal, imperfect though it is, is about the best balance of obligations we can get given the constraints we have placed on ourselves. If Brexiters hate it, it is more their own fault than that of Theresa May.